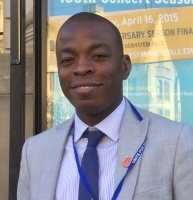 Michael Samadji, a Ghanaian Nurse registered in Ghana and USA, holds a Bachelor of Science in Nursing from the University of Cape Coast, Ghana, as well as a Masters Degree in Leadership and Health Management from the University of Southampton, UK. He has been at the forefront of various community health projects including blood donations, health education and sanitation. Michael, an advocate of quality health systems and policies, has special interest in health system designing, primarily focusing on Public Health and Emergency Care, to address most of the health challenges of global populations. He is a team player and has good leadership skills. He has been a participant of key world health conferences. He has five (5) years of experience as Medical Nurse. He was once a volunteer nurse at the Atua Government Hospital, worked at the Koforidua SDA hospital and served as the Head of the Emergency Unit and Out Patients Department at the St. Joseph Hospital, Nkwanta in the Volta Region of the Republic of Ghana for two (2) years. While at St. Joseph, he served as a member of some key hospital committees including HIV/AIDS/TB, Quality Assurance, Drug and Therapeutics. He was also the Focal Person on clinical emergencies. He also worked for two years as an oncology nurse at the Sweden Ghana Medical Center (SGMC), an ultra modern oncology hospital in Ghana serving patients from the West African sub-region. He brings on board his strategic management skills and transformational leadership drive to help advance the organizational goals of GHI. Annalee Nevins Adjepong, an American Registered Nurse, holds a Bachelor of Science in Nursing from Radford University, USA and has eight (8) years of experience as Medical, Surgical and Oncology Nurse. She worked at the Intensive Care Unit (ICU), Sibley Memorial Hospital in Washington D.C for two years. Her desire to help save more lives with her acquired nursing skills enforced her decision to move to Ghana, West Africa in 2012, where she, together with some colleagues started a community health outreach program. Later that same year, she joined SGMC (Sweden Ghana Medical Centre) in Ghana as an Oncology Nurse until 2014. Currently, she works at the Health Unit, United States Embassy in Accra, Ghana. She possess excellent analytical and reasoning capabilities, demonstrates leadership, and extraordinary ability to acquire knowledge quickly and accurately. She adapts to versatile situations and comfortably relate and work well with others irrespective of their background. Annalee is recognized throughout her career as an effective and reliable team player.